Match prediction is a crucial process in TeamForm Rating System as the post-match rating exchange is calculated from comparing predicted result and actual result. After the system ran for a period of time, it will be more stable and the match predictions will become more accurate if the system is doing well in right direction. The graph above shows the comparison between predicted percentage and actual percentage of home win in over 1.2 million matches since 2006. The lines should be perfectly straight if the predictions are 100% accurate (red line). 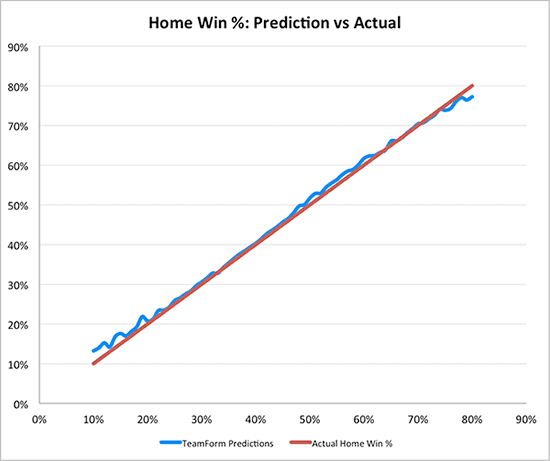 The blue line shows how accurate is the predicted percentage on home win. The correlation coefficient is 0.998. When the coefficient is 1, it means that the two variables being compared have a perfect positive relationship; when one variable moves higher or lower, the other variable moves in the same direction with the same magnitude. In other words, a correlation coeffiicient close to 1 means the predictions are accurate. 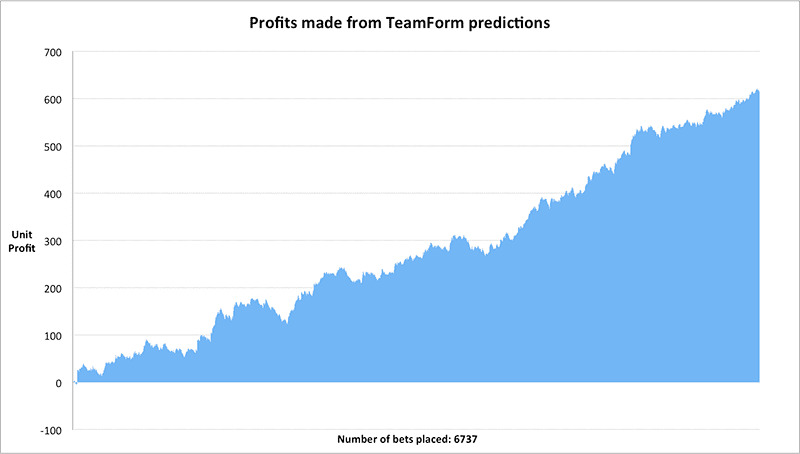 The graph shows the profits growth in a betting system based on TeamForm ratings and predictions. The rule is betting on home win if the predicted home win percentage is at least 15% higher than bookmaker suggested. 618.5 units of profit were generated from 6737 bets during Jan 2015 to Aug 2017 and the yield % is 9.2%. Odds used in the system are from bet365 with average over-round of 110%. This is a simple blind-bet-type system. More profits are expected if the system bet with better odds. TeamForm Ratings tell you the true ability and form of football teams and all these form a solid base for all punters. Anyone can make the betting system even more profitable and the sky is the limit.